In many nations today, the state has little capability to carry out basic functions like security, regulation or even core service delivery (health, education, water, etc). Enhancing this capability, especially in fragile states, is a long-term task. In this video, Lant Pritchett uses the example of Haiti and India to highlight administrative capability trapped in a big stuck. You can watch the video below or on YouTube. If you are interested in learning more, read Looking Like a State: Techniques of Persistent Failure in State Capability for Implementation and Is India a Flailing State? : Detours on the Four Lane Highway to Modernization. In order to better understand and respond to implementation failure, it is instructive to start with a big picture summary of what we think most people believe “development” to be. In this introduction video, Michael Woolcock discusses how a society undergoes a four fold transformation in its functional capacity to manage its economy, polity (political systems represent the aggregate preferences of citizens), society (rights and opportunities are extended to all social groups) and public administration (organizations function according to meritocratic standards and professional norms), becoming “developed” over time. You can watch the video below or on YouTube. If you are interested in learning more, read Looking Like a State: Techniques of Persistent Failure in State Capability for Implementation. This is the last of the four common excuses that I hear about why PDIA cannot be done in development. If you are interested, you can read the first, second and third one. I firmly believe that PDIA has its most value when we are in complex settings dealing with complex problems, where we don’t necessarily know the solutions or how to implement the solutions. In such situations one needs a process of finding and fitting relevant solutions that are unknown at first. This is where PDIA comes in and is useful . If PDIA is used at the start of reforms in such contexts, one can find and fit solutions that have functional impact. A more traditional project process can be used once one knows (at least to some degree) what to do and how to do it. So you don’t need to muddle along forever… And PDIA is not about perpetual muddling – it is about structured, experiential learning. This is the third of the four common excuses that I hear about why PDIA cannot be done in development. If you are interested, you can read the first and second one. 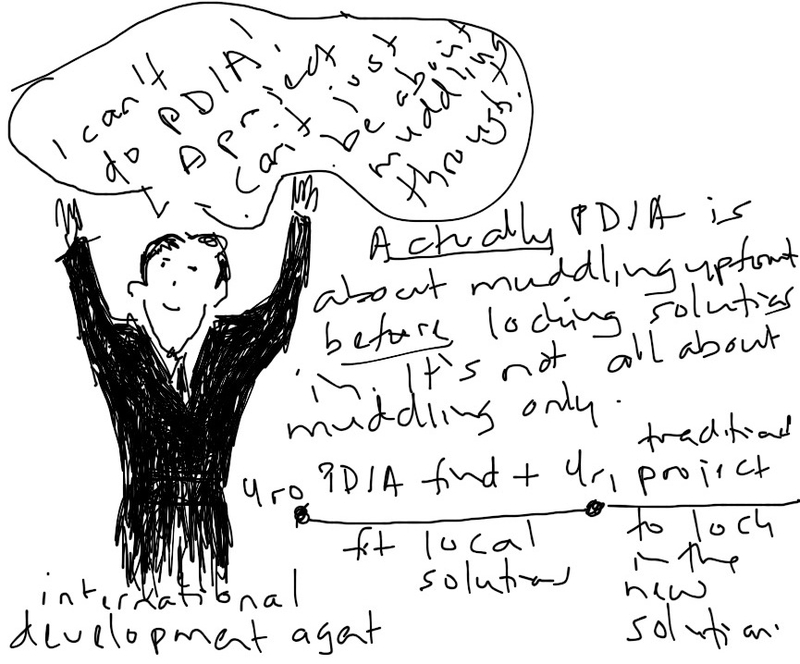 Excuse 3: International development experts often tell me that PDIA is not possible because it takes too long. This is not true, especially when one considers the timing issues of traditional development projects. In my experience, many development projects last 5 years or so and deliver little more than new forms. These projects are then followed by a new project doing the exact same thing. Yes I know it sounds far fetched, but I see this in all countries and areas of development. So, if the counterfactual is 20 years of anti corruption reform in Malawi (that did not curb corruption) why say PDIA is too slow when it calls for crawling the design space for a year or two before we lock in a solution? Second, traditional projects take ages to prepare (often one to two years). The preparation is largely passive, based on work in offices by project designers whose ‘product’ is the project design (not its implementation). PDIA offers much more with multiple active experiments and iterations in the context that lead to on the ground learning, capacity building, team and coalition building, experiential learning and active project design + quick wins. These gains far exceed those of many traditional project design phases, and yield projects that are already being implemented. Iterative processes take multiple steps, but these are not necessarily long, can be much shorter than one step projects, and offers an opportunity for structured learning along the way. We need to use our time well and PDIA allows us to do this. This is the second of the four common excuses that I hear about why PDIA cannot be done in development. If you are interested, you can read the first one. 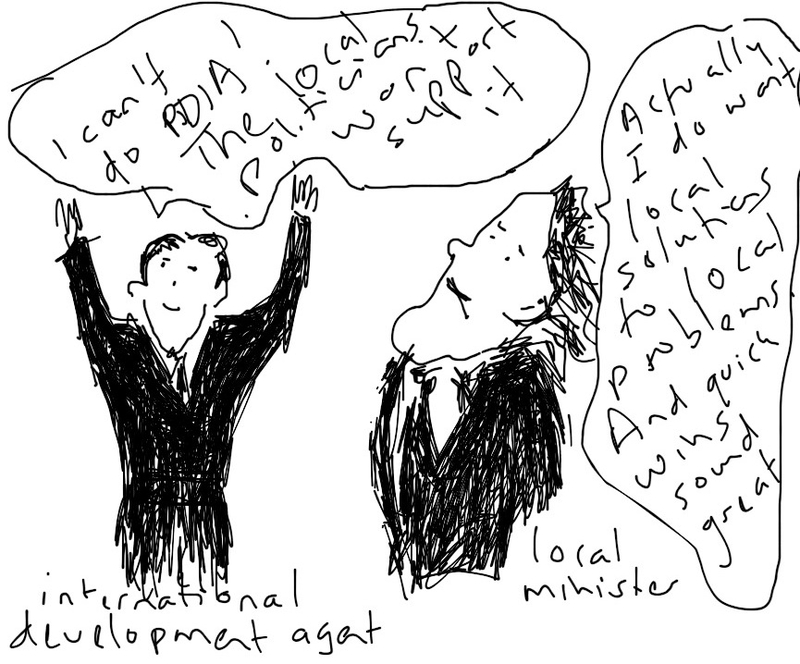 Excuse 2: International development experts often tell me that PDIA is not possible because politicians will never support it. Again, simply not true. It is true that many politicians will look for big projects promising large things. This is what I call signaling in my book and is a major constraint in many countries. I think it is facilitated by donors who offer large loans in response to big promises for best practice, which often leads to a ‘what you see is not what you get‘ situation. But my research shows that there are reforms that yield functional improvements in government. And studies of these reforms suggest that politicians can also welcome and support PDIA type processes that go beyond signaling. Where a locally felt problem exists, it is clear to me that politicians are often very interested in processes that promise real solutions. And many politicians are aware that these solutions need to emerge gradually so that they are properly authorized and capacitated. 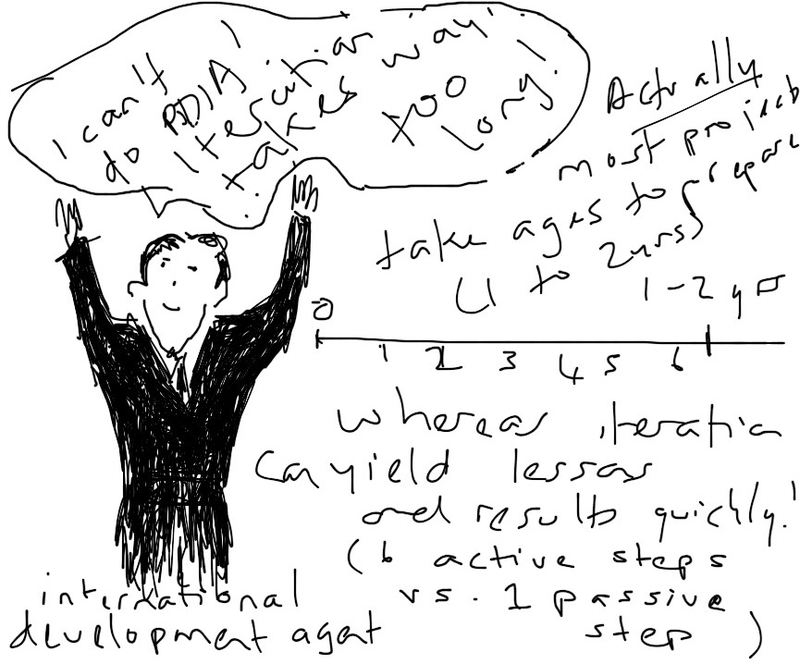 So a PDIA approach of active and iterative engagement is not foreign or unwelcome in such situations. Indeed, I see many politicians creating a holding environment for such engagement. These politicians value the tight feedback loops and the rapid opportunities to learn and build capacity in their organizations. They also like the quick wins, especially when these wins feed into broader narratives about solving problems and promoting development. Indeed, tight iteration may overcome the time inconsistency problem we often see in reform (where politicians need results quicker than a large multiuser project can deliver). Read the Burundi post for an example.